A decision is taken to evacuate our naturalist/guideKaren. Her back is not good. Unfortunately, it is very foggy where we are this morning, so arrangements are made to have the Niad Explorer (a very fast whale-watching boat) meet us in Echo Bay, later that day. Luckily for Karen, her mom has been along to help take care of her. Today we have a long paddle and we set out after a very hearty breakfast of porridge. The porridge is a huge crowd favourite and the Adams peanut butter continues to disappear at an alarming rate. We get into the kayaks by about 9:30 and are greatly aided by Don, who helps Bill up top with the kayaks and Celeste who is helping Sharon by serving the food. Not having Karen on hand means that Sharon's work load is effectively doubled. Our first kayaking destination is a very large eagles' nest which the Americans LOVE. We slide up to a grou of harbour porpoises. Then, we are surrounded, and herded into a small group, by the same group of (perhaps friendly? perhaps hungry?) Harbor Porpoises. The sound of their breathing is unique - a combined inhale/exhale that can be heard from afar. Seals are always on hand, giving us a close going-over before sliding back underwater. The porpoises come very close to the kayaks - they seem to be a bit brighter than the kayakers. Don does a passable imitation of the breathing sounds of the porpoises, but he fails to find a mate. After this encounter, we paddle off to our luncheon engagement with Bill on the unfortunately named Insect Island. There are no insects, but the huge midden and spectacular forest make for a very enjoyable luncheon spot. A fire is prepared and soon all the mothershipers are feasting on fresh crab, a selection of cheese, hot garlic toast and smoked salmon and a salad. The beach at Insect Island. NO insects, but lots of crabs. George and Eleanore careen around the ocean. Bob and Hannelorr in the background. Eleanore had been riding shot gun all day in the kayak with George on Wednesday and wisely decided to take today off after getting toured around the ocean. After lunch she and Bill rejoin Karen and Sharon on the Columbia. We paddle off against a fairly strong current and have another couple of hours in the kayak before rejoining the Columbia for the trip to Echo Bay. We load the kayaks 'on the fly'. On the way to Echo Bay, George regales us with the story of how he got to be in the very famous movie "Too Late the Hero" - as someone who dies and as someone in a crowd scene and as someone who provided the technical expertise for the use of a helicopter while filming. "A very minor role," he says. George, apparently, likes Michael Caine who treated him to a fancy luncheon. Starring Michael Caine, Cliff Robertson, Henry Fonda, George Gring, Ian Bannen, Harry Andrews Two reluctant soldiers (Robertson, Caine) sent on suicide mission on Pacific island during WW2; turns into battle of wits between them and Japanese officer. Action- packed film builds to pulsating finale. Shown on network TV as SUICIDE RUN. Metroscope. 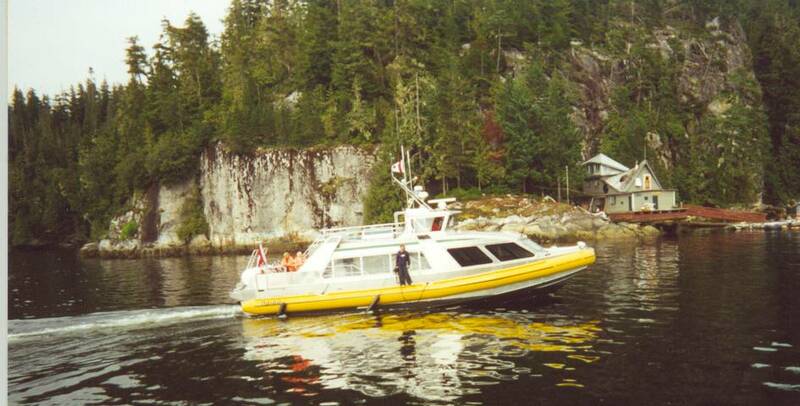 We arrive at Echo Bay and the Niad Explorer arrives to take Karen away to hospital. It is a challenge lifting her from the bedroom, up the stairs, off the Columbia and on to the Niad Explorer. She's strapped on to a stretcher and is basically dead weight but she makes the transfer without injury. Halfway through the transfer it is determined that a better job could have been made of lifting her up from downstairs and she's asked if she wants to go back down and come up again so that the new theory can be tested. Her reply indicates that although she's in a lot of pain and fairly drugged up with nitrous oxide and what have you, she still has her sense of humor. Strangely, George, who has SIGNIFICANT rescue experience, and is probably the strongest, is not the lead in Karen's transfer. Sharon (Karen's mom) goes with Karen. The Niad Explorer is quite a boat. Fast, it can make the trip to Vancouver in six hours. It came out of the factory able to travel at 65- 70 mph, but was de-tuned so that it only can go 50. At Echo Bay, Bob meets up with Barbara, a sailboat owner with a cat. The next thing you know, Bob is on board the sailboat for a tour including a peek into her toilet. The Columbia then takes off for an anchorage at the foot of Kingcome Inlet and a delicious meal of fresh halibut with white sauce and rice, broccoli and a salad. Sharon picked up a very good cake at Echo Bay which was quickly 90 per cent devoured by the remaining mothershippers. We had aa toast to Karen - wished her well and a quick recovery.